RUSH: Grab sound bite number 1. This morning on — well, whatever — WINS radio, 1010 news radio in New York, the anchor is talking about Trump’s trip to Grand Rapids, Michigan, last night. RUSH: “Lock ’em up.” Now we move over to CBS This Morning, political correspondent Ed O’Keefe reporting about Trump’s rally last night in Grand Rapids, and Gayle King weighed in at the end of this one. O’KEEFE: And thank you very much. We wish you a slow news day today on this Friday. KING: Yes — and we’re glad you’re not calling people “Pencil Necks,” too. RUSH: Well! Look what gets under their skin. 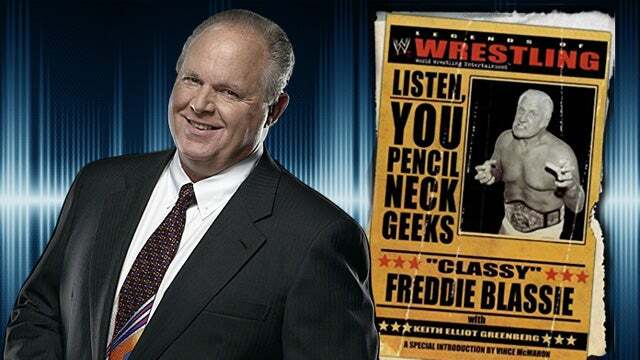 Look what gets… You know, this Pencil Neck business, folks… Many of you know — and we’ve acknowledge it — that the originator of this phrase is a former great character in professional wrestling named Freddie Blassie. He nicknamed several of his opponents “Pencil Neck Geeks.” That’s what he called ’em. So I appropriated that, but I eliminated the word “geek” so as not to thoroughly copy Freddie Blassie. Now Pencil Neck, it’s being recycled. But Freddie Blassie is the original guy that coined all this, and that has to be said.